About as close up to a polar bear as you want to get for a portrait picture near the town of Churchill in Manitoba, Canada. Even a close up image of a polar bear doesn't reveal it's true colour. Their skin is in fact black and the white coat is made up of translucent hairs. The wide open expanses of tundra on the shores of Hudson Bay near Churchill in Manitoba, provide great camouflage for the bears and they are hard to spot after fresh snow. 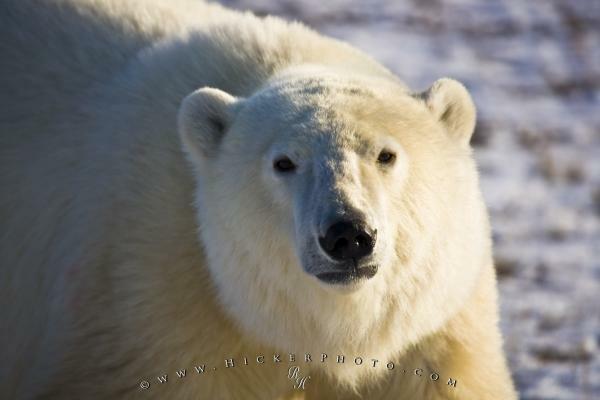 It is a real treat to be up close to a polar bear and very exciting to be able to get a portrait picture however, one must remember that these animals are the largest land carnivore in the world and should be treated with respect. in Hudson Bay, Manitoba, Canada.